Just in case you were wondering what it all looks like without the seran wrap and the blood, I took some more pics of this stage in the tattoo (and it's surprisingly hard to take pictures of your own back). 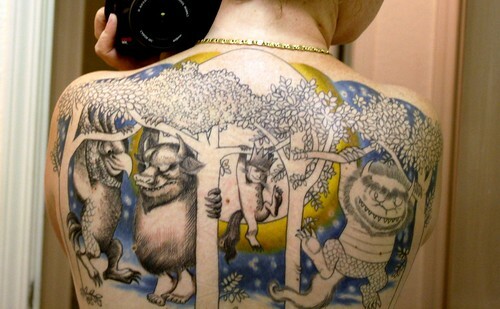 Anyhow, at this (third) appointment, George shaded Max and two of the wild things, and did the yellow around the moon. 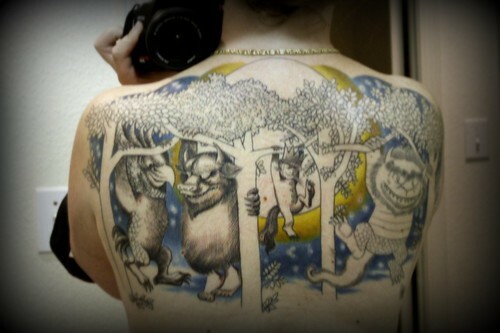 What remains to be done is the shading of the final wild thing, and coloring of the figures and trees.